The Curiosity Rover has had one hell of a ride on Mars. Unless you’ve been hiding under a Martian rock, you’ve probably heard of Curiosity’s myriad findings supporting the idea that Mars once was a wet planet. In fact, we earthlings may even owe our existence to Mars. Curiosity roves on, and as it does, it uncovers more and more information about the water that used to flow on the red planet. At the recent European Planetary Science Congress Conference, more specific details were revealed about Curiosity’s water-related finds, and about the rocks that suggest ancient Mars may have harbored primordial life. 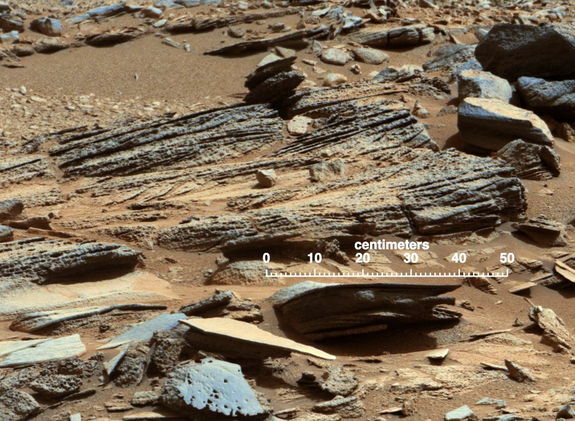 Scientists know that at the time the rocks formed, Mars was in a particularly wet period. That period continued as water flowed through the rocks, creating and deepening fissures and fractures. It was in those fractures that scientists found calcium sulfate deposits — the evidence that confirms the existence of the water billions of years ago. 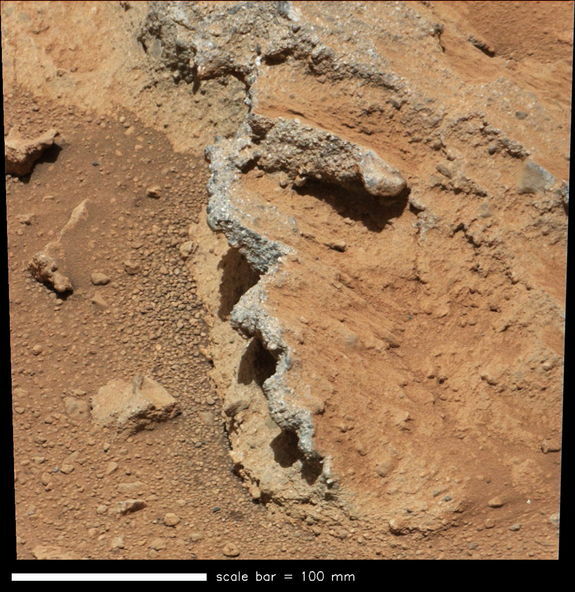 Curiosity also found and drilled into mudstones that contained clay minerals, additional evidence of water. Back in 2004, findings by the Opportunity Rover suggested that much of the water on Mars would have been very acidic, but these recent findings suggest that the water was neutral, and thus, able to support life. Mudstone is formed during a slow process that allows grains to settle, usually caused by water or wind. In the case of Mars, scientists believed that the mudstone was formed by calm water, perhaps in a lake. The calmness of the water is important in supporting microbial life, as choppy or rough water makes it tough for microbes to start growing. Another piece of rock evidence discussed at the conference is a pebble called Tintina, which was broken apart by Curiosity. Tintina’s insides are white, which also suggests mineral deposits from billions of years ago. Even Mars’ surface contains evidence of water. The surface rock contains fissures that, like many of these other samples, maintain evidence of calcium sulfate, indicating that at some point minerals that help rocks form were dissolved by water. Finally, the ancient riverbeds, such as Hottah, were found to contain sediment that once formed big dunes on the river, which slowly dispersed and migrated with the current. The riverbeds now contain pebbles and grains of sand that couldn’t have been deposited there by wind because they’re too heavy — they had to have moved by water, just as happens on Earth. Curiosity is now headed to Mount Sharp, where it will arrive in May or June. It will climb the base of the mountain, analyzing rock layers as it goes. Scientists believe that the base of the mountain is surrounded by more rocks that contain sulfate deposits, and they hope analysis of the rocks will provide additional information about how the mountain formed and how Mars’ landscape has changed over time.